The first full Captain Marvel trailer has dropped. Marvel fans giddy for a female lead and some 90s nostalgia. The film marks the MCU's first appearance of fan-favourite character Carol Danvers, who was created by Roy Thomas and Gene Colan. 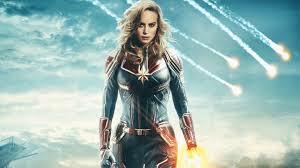 Carol Danvers was created in the 60s, but the character only took up the mantle of Captain Marvel in 2012 in an ongoing series written by Kelly Sue DeConnick; though there were several Captain Marvels before her, Danvers remains the most recent and most popular. Snap on your slap-bands and hike up your happy-pants, 'cause this film's gonna herald a boom of 90s nostalgia in a big way, I reckon. Gloriously, the trailer shows Carol crash-land into a Blockbuster video store, one that looks like it's at the peak of the franchise's powers. The film also reportedly boasts a soundtrack that is bounding with 90's pop bangers. "I keep having these memories. I see flashes... I think I had a life here... but I can't tell if it's real." Ther trailer shows shots of Carol's past life on Earth (predominantly as an Air Force fighter pilot, which is true to the comics), but establishes that she can't quite remember it, implying that though the film might touch on her origin, it's going to dive into the adventure (and into the Blockbuster store) face-first. It looks like Nick Fury's appearance will be less of a cameo and more of supporting role, showing how the S.H.I.E.L.D veteran first got acquainted with superhuman activity. We also see Fury rocking two eyes, which is significantly one more eye than we normally see him walking around with, and the safe money is on the probability that the film will show us how he actually lost his eye. 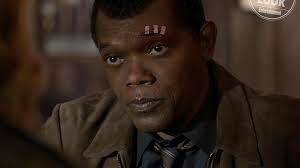 Fury, of course, is played by Samuel L. Jackson, looking digitally de-aged to resemble his youth circa "Pulp Fiction". The film will also feature a return appearance of fan favourite Agent Coulson, portrayed by Clark Gregg, also digitally de-aged. ALL ON THE SAME PAGE? The trailer shows Fury holding a pager, which would seem insignificant enough if not for a post-credits scene in Infinity War. 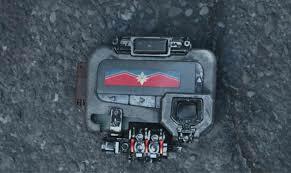 Captain Marvel's first full onscreen shout out was a foreshadowy Easter egg in which <<SPOILERS, I S'POSE>> Carol's boss lookin' logo appearing on the screen of Nick Fury's device as he summoned her in an emergency. The pager in the Captain Marvel trailer looks remarkably similar, so can we assume that they're one and the same? 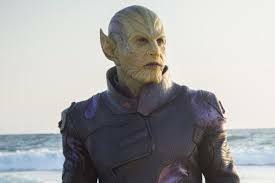 Finally, Skrulls in the MCU! Though not (yet) as well known to people who aren't big ol' nerds (ahem) Skrulls are a staple of old school Marvel adventures, and have been since they were created by Jack Kirby way back in 1962. The villainous alien invaders were previously forbidden from being in the MCU, since they were legally distinguished as "Fantastic Four" characters, a property that was indefinitely licensed by Fox. But since then, the insatiable corporate beast known as Disney ate up Fox like a piece of popcorn chicken, and now Skrulls and the MCU are together again! Happy ending. Oh, by the way, the Skrulls are a race of shapeshifters, so that old lady on the train who Carol punches in the face is presumably a Skrull in disguise. That, or maybe the old lady just had a hot take on how the superhero genre is fatigued. Tell your story walkin', Grandma Buzzkill. By the way, Disney have also announced their own exclusive streaming service, which we can assume will eventually house every single one of the MCU films, and much much more. Until then, you can still catch 'em when they're on existing streaming services. Either way, you can make sure your broadband is up to speed by clicking here! Will net neutrality repeal reach Australia?